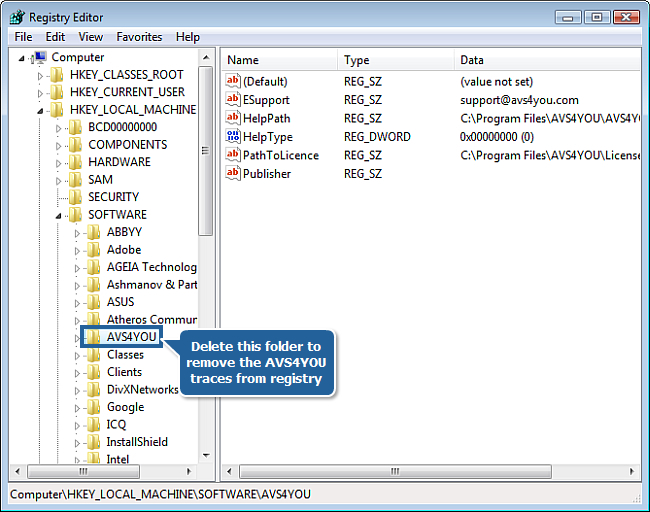 How to reinstall AVS4YOU programs? There can be several reasons to reinstall the AVS4YOU programs. You may need it if your program files were accidentally removed, infected or damaged. The applications issued by AVS4YOU should be also reinstalled if you'd like to download their updates which become available on AVS4YOU official website. Updates are usually released to add new features to the program and fix bugs found in the previous versions. Below we'll describe how to reinstall the AVS4YOU software. To uninstall the AVS4YOU applications using our uninstall tool, go to Start >> All Programs >> AVS4YOU >> Uninstall in Windows main menu. For more information please refer to the instructions here. To avoid conflicts of versions clean the Windows registry. Note: Please follow the guidelines closely and do not modify other elements of Windows registry because it can lead to the corruption of Windows file system. We strongly recommend you to make a backup copy of the Windows registry, it helps to roll back the system if any problems occur. For this purpose use our AVS Registry Cleaner or go to: Start >> Control Panel >> System >> System Protection and create a restore point. Run the Registry Editor utility (regedit.exe): type regedit in the start menu search box and press the Enter key. The Registry Editor window will be opened. On the left side of it you will see the hierarchical tree which displays the registry structure. 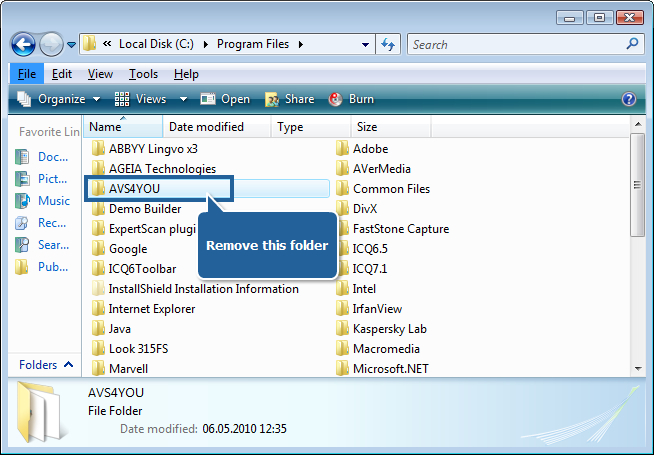 Go to HKEY_LOCAL_MACHINE >> Software and delete the AVS4YOU folder to remove all traces of AVS4YOU applications. To do this right click this folder and choose Delete. Note: if you are using the 64-bit version of Windows XP/Vista/7 then you will need to go to HKEY_LOCAL_MACHINE > SOFTWARE > Wow6432Node > AVS4YOU and delete the AVS4YOU folder. Next go to HKEY_CURRENT_USER >> Software and do the same to delete all the elements of AVS4YOU applications there. Now you can close Windows registry explorer and proceed with the following step. Open the Windows Explorer and find, where the AVS4YOU software was installed previously. If the default installation settings were not modified, go to your system disk, often C: drive\Program Files. Otherwise, you should enter the correct path manually. 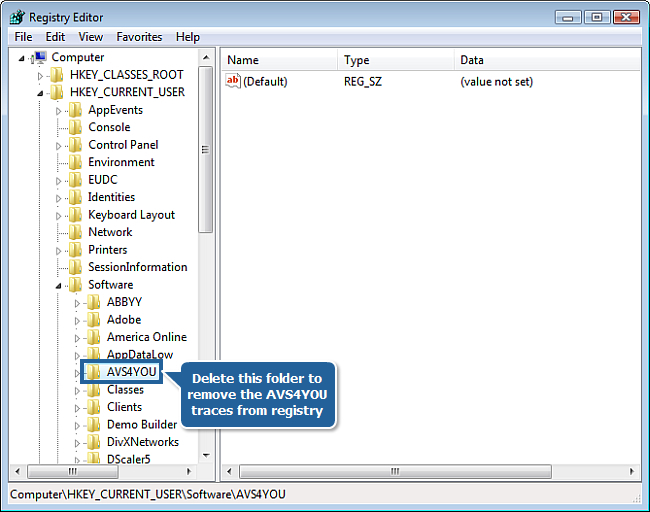 Note: to find out the AVS4YOU software location (before you start the deinstallation) you can right-click any AVS4YOU program desktop icon and select Properties. You need to remove the AVS4YOU folder: right click it and choose Delete. Note: if you are using the 64-bit version of Windows XP/Vista/7 then go to your system disk, often C: drive\Program Files (x86) and delete the AVS4YOU folder. 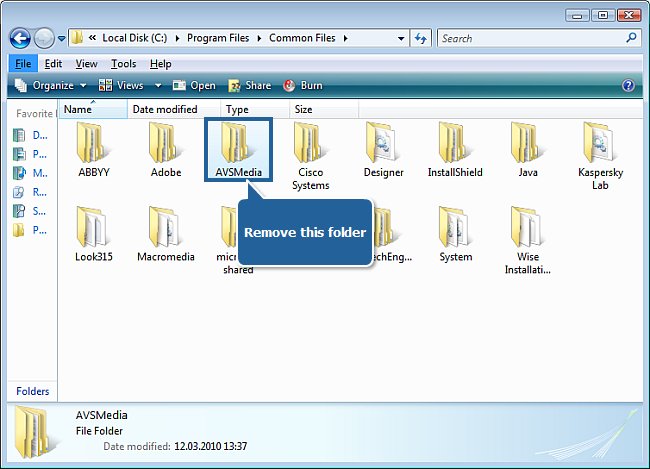 In the same session of Windows Explorer go to your system disk, often C: drive\Program Files\Common Files to delete the AVSMedia folder. Right click it and choose Delete. Note: if you are using the 64-bit version of Windows XP/Vista/7 then go to your system disk, often C: drive\Program Files (x86)\Common Files and delete the AVSMedia folder. You have successfully uninstalled all AVS4YOU applications. To avoid the possibility that your activation might be damaged after you reinstall AVS4YOU applications so that the programs become non-activated again, remove the license folder. 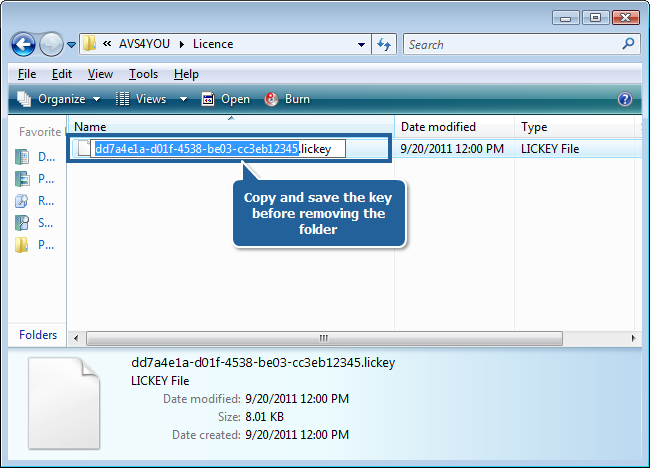 Note: if the email message with the license key received after the purchase has been lost, copy and save the name of the .lickey file from the folder before removing it. In Windows Vista/7, this folder can be found at C:\ProgramData\AVS4YOU\Licence. In Windows XP, it is located at C:\Documents and Settings\All Users\Application Data\AVS4YOU\Licence. Download and install the latest version of AVS4YOU software package. To do this follow the recommendations here. To reactivate the applications after you install them anew use the license key from the registration email or the key you have copied at Step 3 and follow the instructions from Step 3 through Step 5 of the How to activate the AVS4YOU software? guide.